Can't attend? Follow Sony Music Singapore to know of future events! Has Sezairi’s latest album got you begging for more, more, more, more, more? Come witness one of the country's best live performers at his debut showcase here in Singapore! Groove the night away with Sezairi as he performs his chart-topping hit ‘Fire To The Floor’, as well as other brand new tracks from his latest album LIVE for the very first time! 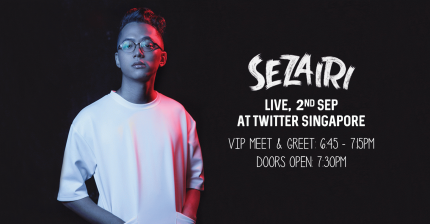 The self-titled album is Sezairi's debut full-English release and comprises 6 brand new tracks including the #1 Spotify Singapore Viral 50 hit ‘Fire To The Floor'. The recently wedded 28 year old decided to use his recent marriage as inspiration by channeling experiences from their 7 year relationship into his music; with each track on the album representing a distinctive milestone essential in cohesively illustrating the journey.